This tutorial will walk you through the creation of a sample application that contains RadDateTimePicker. Before reading this tutorial you should get familiar with the Visual Structure of the RadDateTimePicker control. You can add RadDateTimePicker to your application manually by writing the XAML code in Example 1. You can also add the control by dragging it from the Visual Studio Toolbox and dropping it over the XAML view. In order to create the RadDateTimePicker control you have to include the following namespace declaration: xmlns:telerik="http://schemas.telerik.com/2008/xaml/presentation"
If you run the application now you will see the default RadDateTimePicker control with the default watermark content. 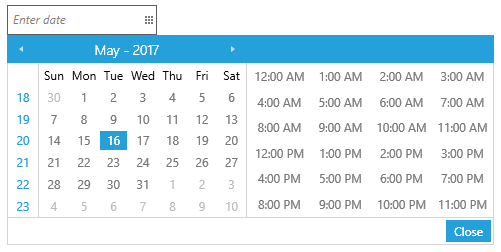 Clicking on the control's drop down button will display a date and time representations from which you can select a single value. SelectedValue: A DateTime representation of the selected date and time or null if no value has been selected. SelectedDate: The Date part of the currently selected value. SelectedTime: The TimeOfDay part of the currently selected value. Normally you would want to bind the SelectedValue property to your data as demonstrated in Example 4. In case the bound property value needs to be manually updated at some state, the DateTimeText property of the control can simply be set to be equal to the CurrentDateTimeText one. The CurrentDateTimeText property is updated each time the user types in the textbox, whereas the DateTimeText is updated once the textbox has lost focus, for example. 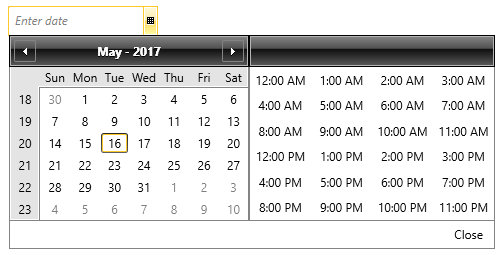 Figure 2 shows RadDateTimePicker with the Windows8 theme applied.